6. Which of the following indicates that animals have internal biological clocks? A. A mouse kept in constant darkness shows a daily rhythm of activity. B. A rooster crows whenever the sun rises in both winter and summer. C. An owl kept in constant light drifts away from a 24-hour cycle. D. Some species of birds can sense fluctuations in the Earth's magnetic field. E. A squirrel whose night and day are artificially reversed soon adapts to its new schedule. 7. Which of the following correctly lists the phylogenic hierarchy? A population of birds (Population A) on a remote, isolated island is studied to determine beak length. The resulting data are plotted in Figure 1. Suppose that 200 years later, the beaks of the birds on the island were again measured (Population B). The data, when plotted, yielded a graph as in Figure 2. 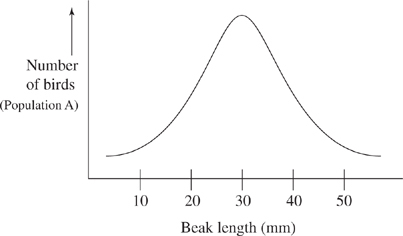 What is the average beak length (in cm) of the birds in Figure 1 ? What is the most likely reason for the difference in distribution of beak lengths between the data plotted in Figure 1 and the data plotted in Figure 2 ? A. All birds with beaks of 30 mm flew to a new island over the 200-year time span. B. Birds with beaks of 30 mm were selected against. C. Predators consumed birds with beaks of 40 mm. D. Predators consumed birds with beaks of 20 mm. E. Birds with beaks of 30 mm were selected for extinction. How would beak length in the bird population change after another 200-year time span? A. The average beak length would return to 30 mm. B. The average beak length would shift to 40 mm. C. The average beak length would shift to 20 mm. D. The differences in beak length would be more pronounced. 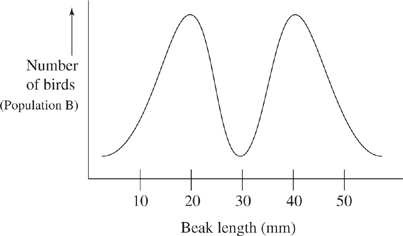 E. It is not possible to determine how beak length might change. 14. Acid rain is formed after the burning of fossil fuels releases compounds containing nitrogen and sulfur into the atmosphere. Sunlight and rain bring about chemical reactions that convert these compounds into nitric acid and sulfur dioxide, which combine with water droplets to form acid rain. Acid rain typically has a pH of approximately 5.5. The higher acidity of soil and water affects many living organisms adversely. As the pH of lake water falls, fish become ill and die. 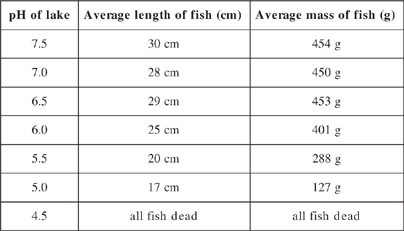 Table 1 shows the effects of pH on the size of adult fish. Mycorrhizal fungi, which form a mutualistic association with many plant roots, are particularly sensitive to the effects of acid rain. These fungi facilitate the absorption of water and nutrients by the plants; in turn, the plants provide sugars and amino acids without which the fungi could not survive. 15. Acid rain is formed after the burning of fossil fuels releases compounds containing nitrogen and sulfur into the atmosphere. Sunlight and rain bring about chemical reactions that convert these compounds into nitric acid and sulfur dioxide, which combine with water droplets to form acid rain. Acid rain typically has a pH of approximately 5.5. 16. Acid rain is formed after the burning of fossil fuels releases compounds containing nitrogen and sulfur into the atmosphere. Sunlight and rain bring about chemical reactions that convert these compounds into nitric acid and sulfur dioxide, which combine with water droplets to form acid rain. Acid rain typically has a pH of approximately 5.5. A. The fungi would survive but the plant would be harmed. B. The fungi would be harmed but the plant would survive. C. The fungi would be slightly harmed and the plant would be slightly harmed. D. Neither the fungi nor the plant would survive. E. Neither the fungi nor the plant would be harmed. 17. Acid rain is formed after the burning of fossil fuels releases compounds containing nitrogen and sulfur into the atmosphere. Sunlight and rain bring about chemical reactions that convert these compounds into nitric acid and sulfur dioxide, which combine with water droplets to form acid rain. Acid rain typically has a pH of approximately 5.5. 18. Acid rain is formed after the burning of fossil fuels releases compounds containing nitrogen and sulfur into the atmosphere. Sunlight and rain bring about chemical reactions that convert these compounds into nitric acid and sulfur dioxide, which combine with water droplets to form acid rain. Acid rain typically has a pH of approximately 5.5. 19. 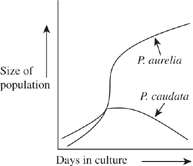 The following graphs show the growth of two closely related species of paramecia, both when grown alone (Figure 1) and when grown together (Figure 2). Both species consume bacteria as their food source and reproduce by binary fission as often as several times a day. 20. 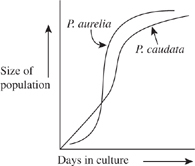 The following graphs show the growth of two closely related species of paramecia, both when grown alone (Figure 1) and when grown together (Figure 2). Both species consume bacteria as their food source and reproduce by binary fission as often as several times a day.